A bulletin is like a notice which provides essential information to the readers. A funeral bulletin is usually used to pass on the information about the event that is to take place. It contains some details like the date, time and venue of the funeral. Now when you are organising an event, you should always opt for ways that reduce your hassle to a large extent. 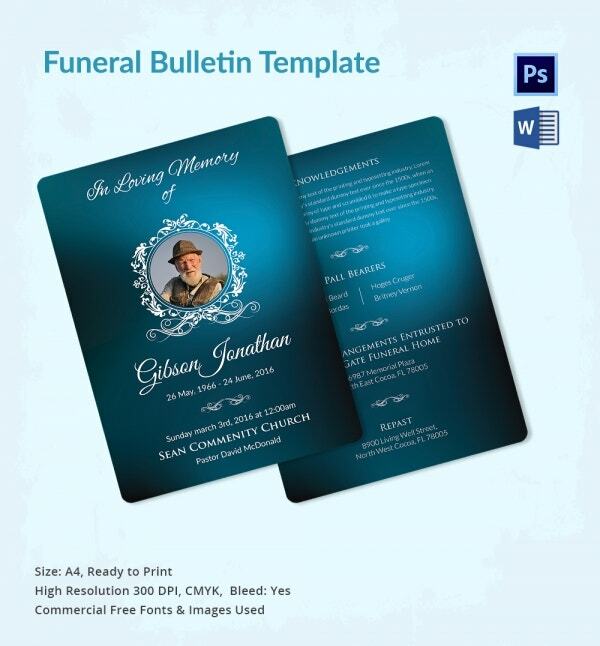 While sending out invitations, funeral bulletin templates would come in handy that way.You can also see Funeral Template. 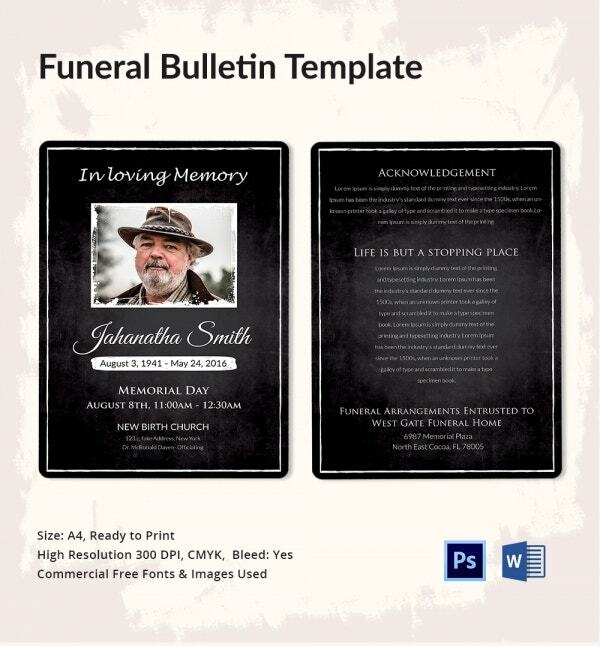 This funeral bulletin template comes with a stunning black background and golden borders adorning its sides. Also, it comes in a standard size and print ready and editable / customisable format. This template is elegant and sophisticated in nature, just as a funeral bulletin template should be. This template comes in a standard size and is 100 % editable. All the elements that you see on template can be edited. This funeral bulletin template comes in an A4 size and with a beautiful, sober background. The white text against the midnight blue background looks appealing and attractive in the funeral bulletin. This funeral bulletin template comes in an A4 size and in a ready to print format. The template has a high resolution of 300 dpi and a colour mode of CMYK. You would also be getting free fonts. 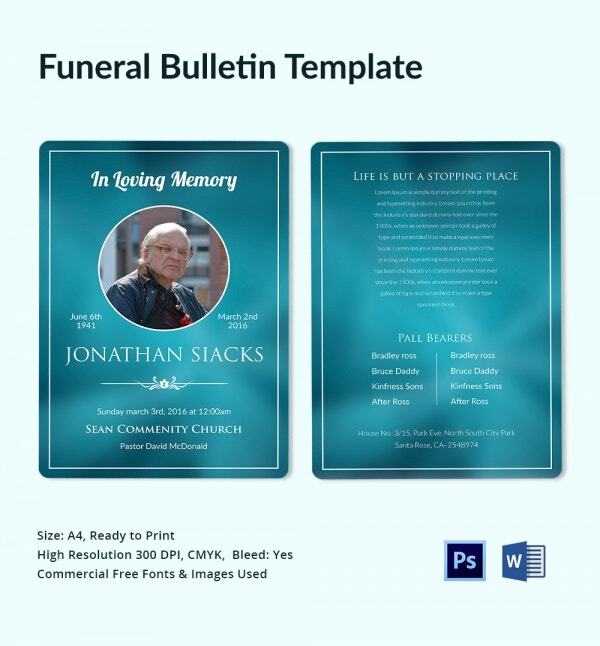 This funeral bulletin template uses a number of free images and fonts that make your work easier. The template has a standard size of A4 and a print ready format. > Why should you go for Funeral Bulletin Points? All the templates here have been developed by professionals who know exactly what you want. Thus, the templates are dignified and elegant. They are sober and go with the ambience of the event. The templates are fully customizable. Once you download the template, you can follow the sample provided and edit the minute details to personalise it. Also, the templates come in a number of different formats all of which are easy to use. Plus, they are all attractive and appealing to the eye. 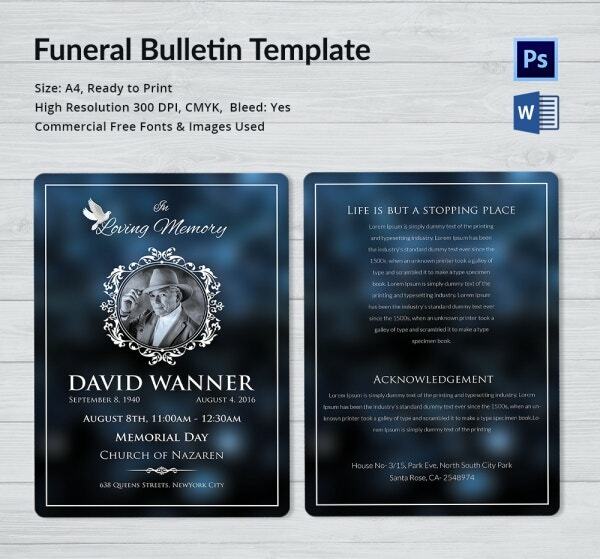 > What do the Funeral Bulletin Templates Contain? 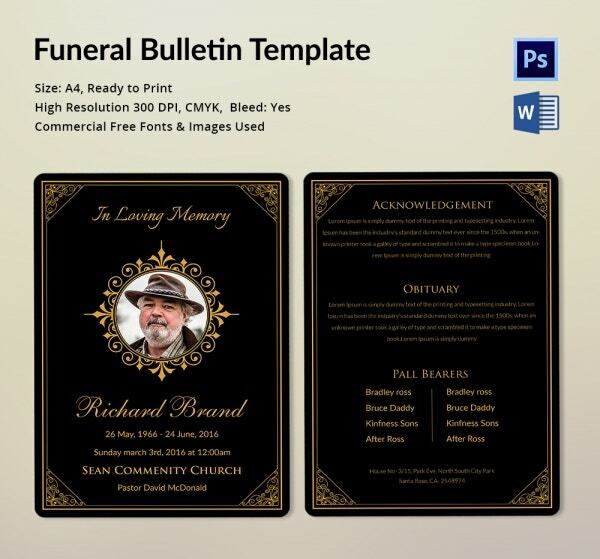 Most of the funeral bulletin templates contain the same basic details. For instance, they all contain a subdued background against which the textual elements stand out. Next, you have a heading or a catchy title which immediately catches the eye. That is usually followed by an image of the deceased. This image can be edited. After a statement or two, the time, date and venue of the event is to be mentioned in neat clear terms. Usually, each funeral bulletin template consists of a splendid border. The border makes the template look all the more elegant, posh, beautiful and sophisticated. You can also see Funeral Templates for Father. Most of the funeral bulletin templates that you see here come in a word format that is easy to use. 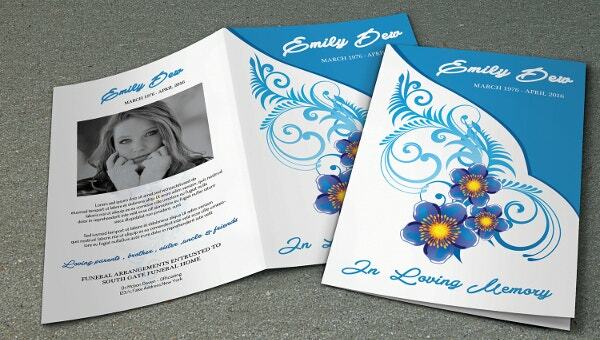 All you have to do is go through this exhaustive list of funeral templates, select the one that goes with your needs, download it, edit or customise it and print it on a mass scale.